Come on, 'fess up! You have some, don't you? I know you do. Lurking in the back of your stash cupboard? Or maybe yours is front and centre like mine? You know, that stash that you are hoarding saving because the company doesn't exist any more and the page you use that last piece on needs to be perfect! 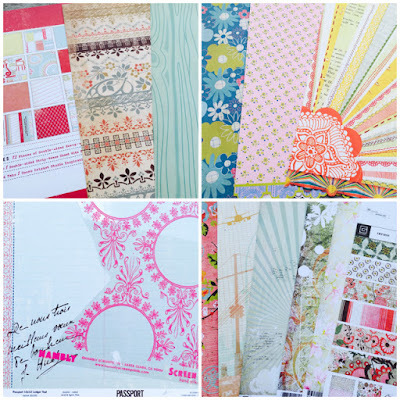 This is going to be hard ladies, but I'd like you be inspired by scrapbooking product made by a manufacture that doesn't produce scrapbook product any more. You can either upload your layout into the Whimsical Musings Flickr gallery with the tag WM#229 or you can post it in our Whimsical Musings Facebook group. We've decided that we'll save albums for special occasions so just load up your photo to the group with the tag WM#229 in the write up text so that we can find it. OH-SO-GOOD one! I may try to combine a few. I even recognize some of those in your pile that I have actually scrapped with!